Please read Teragren Inc’s warranty, maintenance instructions, and ALL of the guidelines before opening any packaging or beginning your flooring installation. The information is provided as a courtesy to our customers and is intended as an installation guideline only. It is the sole responsibility of the installer/owner to determine if the job site’s sub-floor and environmental conditions are suitable for the installation of Teragren flooring and accessories. Teragren Inc. makes no warranty or guarantee of the quality of the chosen installer’s work or of a particular installation performed by the installer. Teragren Inc. disclaims all liability for any errors or improprieties in the installation of its products. Installation of any Teragren product serves as acceptance of that material. See flooring adhesives and power nailer guidelines for products that are warranted to be compatible with Teragren Bamboo Flooring. Complete your design with our extensive line of prefinished accessories that coordinate with all Teragren strand and traditional bamboo products. 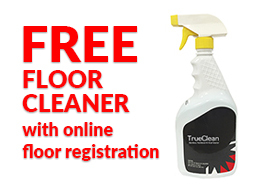 Register your floors and receive a FREE bottle of TrueClean floor cleaner.